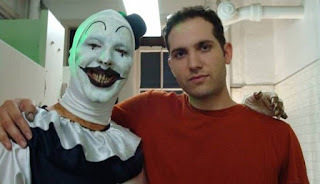 Q: Art The Clown initially appeared in your 2008 short THE 9th CIRCLE, then the 2011 award-winning short TERRIFIER and in your first feature ALL HALLOW’S EVE. What made you decide to give him a fourth outing? DAMIEN: Up until this point I never felt like I fully showcased Art's potential. I believe between the short films and All Hallows' Eve, there only exists about 20 minutes of Art the Clown screen time. For a character who's done so little, he seems to really resonate with horror fans. After all of the positive feedback, a full length film that focused solely on Art was inevitable. Q: Art has a very twisted personality – he’s both brutal (his silence adding to his deadliness) and comical but not without some subtle pathos. How difficult was it to strike that balance? DAMIEN: In all honesty, I never intended to evoke any sort of pathos from his character. I do find that interesting and maybe there is something to that but the brutality and twisted personality was always intentional from the get-go as was the subtle comedy. Although I'm a huge fan of some horror comedies like Return of The Living Dead or Evil Dead 2, it's not a style I strive for in my own films. I always shoot for a more serious tone but ironically, the comedy in Terrifier was very organic and almost wrote itself. I should be clear and say the intentional comedy in Terrifier only comes from the Art the Clown character himself. He's always had a sick sense of humour from the very beginning but this time I tried to take it a little further whereas after every unspeakable act of violence he commits, he follows it with something comical like a facial expression or a quirky gesture. This does two things, it gives the audience a chance to relieve some tension but it also makes Art more demented when we realize just how much fun he's having at his victim's expense. Q: You’ve said that you set out to make Art as violent as possible. Why? DAMIEN. This basically comes from the fact that I'm a special effects artist. I knew the effects would be one of our strong suits going into the film since I can do a lot on a very limited budget. There is so much content out there right now and I believe that if you want to stand out, it doesn't hurt to show things that will really grab the audience's attention and get them talking. It's 2017; there's been thousands of horror movies. I mean how many times can you show a knife cutting through the air followed by a shot of blood hitting the wall? Almost everything has been done to death (pun intended) so I feel I have a duty to the audience to present them with stuff that hasn't quite been seen before or if it has, to do it in a way that feels fresh. Q: David Howard Thornton is terrific as Art. How did you two meet and bond? And how challenging was it, given Art had previously been played by Mike Giannelli. DAMIEN. Finding a new actor to play Art was by far the most crucial and nerve-wracking aspect of this film. Everything people loved about Art was a testament to how Mike Giannelli portrayed him and now I had to start from scratch. Very frightening indeed. But as luck would have it, David came in for an audition one day and my producer and I immediately knew this was our guy. David pantomimed the act of stabbing someone to death and sawing their head off with great exuberance and glee. He's also extremely animated, tall and thin. I always envisioned Art to be of a more slender build and I was excited to see what little quirks and nuances David could bring to the character. Working with David was a total delight from start to finish. We bonded immediately thanks to the countless hours in the makeup chair. Dave will joke and tell stories as I transform him into Art over the course of approximately three hours. We had to repeat this process well over 20 times during the shoot. Q: The film has a very dark 70s/80s tone and the narrative is stripped down to the bone. What influences were at play here? DAMIEN. The main objective was to keep it as close to the 20 minute short film as possible. The short film was a no holds barred, relentless, 70s-style grind house flick that was made to feel like an intense rollercoaster ride. That's actually how I came up with the title Terrifier. To me "Terrifier" was more a reflection of the film as an experience and didn't necessarily have anything specific to do with the characters or story. People responded so positively to the short film that I figured the best plan of attack would be to just make an 80 minute version of the 20 minute short. Essentially this would mean taking the best parts of a slasher film and eliminating as much of the filler as possible. Q: With all the attention given to IT and Pennywise, does this tempt you even further to establish Art as a franchise and make more TERRIFIER films? DAMIEN: Absolutely. Although we finally gave Art his own movie, we've only just scratched the surface. Now we have to dig a little deeper into his backstory. He has a ton of potential and I can see needing at least a couple of films to tell his full story. It's too premature to say but numerous people have said he has the making of a horror icon. 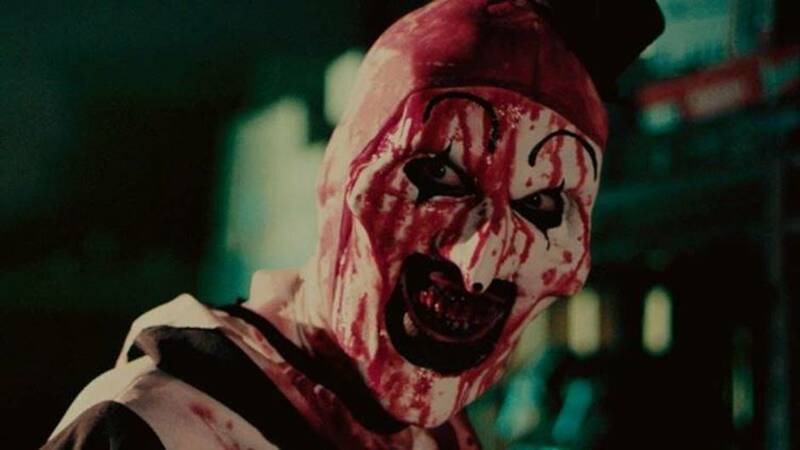 If this continues to be the case once Terrifier is released, it would be downright disrespectful to the character and to the fans to not produce more; just as long as we maintain some integrity and never jump the shark. Q: All your films are set on Halloween night. Are you a fan of Halloween? Do you have a favourite Halloween / clown story? DAMIEN. I am a huge fan of Halloween but the main reason I set Art the Clown's films on Halloween is so it's acceptable for a man to be walking the streets while dressed as a clown. This at least enables his victims to lower their guard around him when they first cross his path. If it was a hot August night and a mute clown sat across from you in a pizzeria, I think the cops would be called immediately. I do in fact have a personal Halloween story that stands out and I'll try to make it quick. One night a few friends and I were driving home from a Halloween party and we passed a car on the side of the road that was turned completely on its side against the guard rail. We immediately pulled over and approached the vehicle. Two young women were inside the car. Apparently, the driver was drunk and fell asleep at the wheel. Thankfully, by some miracle, both girls were perfectly fine aside from being dazed and frightened but what makes this story worth telling is seeing my friend who's 6'4 leap on top of the turned over car in full Spider-Man attire and pull the young women to safety. Surreal moment indeed. Q: Who do you most admire in the horror genre? DAMIEN. This is a very difficult question because I can throw around countless names and ramble on and on for hours but I must say I would not be where I am today if it wasn't for the makeup effects maestro Tom Savini. When I was around 6 or 7 years old I stumbled upon a VHS tape called Scream Greats that changed my life. It was a documentary on Savini and it was the first time I saw how monsters were created. This video and also the making of Michael Jackson's Thriller with Rick Baker really left an impression on me. I was fascinated by seeing people transformed into creatures. For years I would rent these films over and over but when I was around 12 years old, I finally owned a copy of Scream Greats. This time I actually began experimenting. My mother took me to a horror convention where I actually bought my first makeup kit, a 12oz bottle of mint flavoured blood and a real machete (dulled) with a semi-circle cut out of the blade. This is a classic Savini gag that he's used in several movies. It creates the illusion that the machete is actually buried in your flesh when you place it against the skin or on top of your skull. As soon as I got home, I tried out all of my new goodies on my friends and myself. Savini introduced me to blood tubes, mortician's wax, things that were more accessible to someone starting out. Soon I started filming the effects with a camcorder and eventually I began making my own little short films; which is how I became interested in the grander aspect of filmmaking. But even though as a filmmaker I'm influenced by countless artists from all genres, I really have to thank Savini for being the first person to show me the magic of filmmaking. DAMIEN. Very tough question. Zombies frighten me more than vampires. My favourite horror film of all time is Romero's Dawn of the Dead and my dream project is an epic zombie film but The Lost Boys holds such a special place in my heart. I saw it in the theatres when I was literally 3 years old and it had such a profound effect on me. It's one of my absolute favourites till this day and because of it, I love vampires so much. So to answer your question, I can't choose. DAMIEN: There are a few awesome projects that I'd love to tackle but I think it would be foolish to sleep on the inevitable Terrifier sequel. Clowns are so hot right now because of IT and more and more people are starting to dig Art the Clown on a daily basis so I think we should strike while the iron's hot before the killer clown sub-genre goes into hibernation for another 20 years. TERRIFIER receives its UK premiere at Horror Channel FrightFest Halloween 2017 on Saturday 28 Oct, Empire Haymarket, 11.00pm.